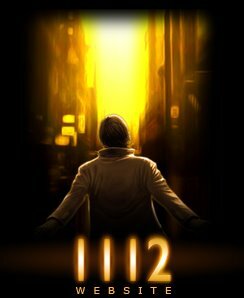 The iPod offers new possibilities for computer games – and one of the nicest efforts to use the possiblities of the device is the epsiode adventure-style game »1112« by Agharta Studios. Don’t read any further if you want to avoid spoilers. Spoilers ahead. Watch out: spoilers! Looking for answers on the board/forum is inconvinient (since some of them are in French). I have written a basic walkthrough for the first episode. I will enumerate the steps, indicating first the location and afterwards the actions. Turning of the alarm clock. [Bedroom] Tap on the stop button. Then shake your iPod. [Corridor] Open the door to the left. [Bedroom] »Move« painting (center piece). »Open« safe. [Safe] Turn the dial with two fingers. Go from 0 straight to 20 (the way you count or counterclockwise), the other way to 80, the other way to 30. [Inventory] (top button on the right) Use maginfier (second button from the top) to watch the medication more closely. Turn it so you can see the pills, tap and »swallow«. Open all available doors, you will be able to reach all the rooms mentioned below. [Kitchen] »Open« cupboard above fridge. »Take« notice (maybe you need to »search« documents first, not sure). [Inventory] Magnify notice. Now you can pinch-zoom (like you do in safari on your iPhone) the notice and magnifiy it. You will be able to read »42°« on the front and the settings of four switches on the back (left, right, left, left). [Restroom] »Take« matches on the right. »Check« boiler. [Boiler] Left dial (black) on 4, right dial (white) on 2, switches left (0), right (I), left (0), left (0). Tap on light, it will be green. [Inventory] »Grab« matches (thrid button from the top). »Use with« boiler. [Hall] »Pick up« wallet. »Pick up« phone. Talk to Felicity. Leave the house. [Garden] »Open« mailbox. »Pick up« envelope. [Inventory] Magnify envelope, turn it around. »Open« envelope. [Corridor] »Switch on« computer. »Use« computer. [Computer] »Tap« on the email-Icon. Pinch-zoom. Tap on the email with the red exclamation mark. Drag-drop all the photos on the printer icon (bottom left of desktop). [Corridor] 4x: »Pick up picture« on the printer. [Inventory] Drag-drop all four pictures into the Goodman-File. Anna’s car key and phone. [Towel] Tap on phone. »Take«. [Garden] Use phone with Anna (pick it up from inventory). »Enter« car. [City Center] Answer iClone. Talk to stranger. [Pharmacy] »Talk to« Don. Option »Dritilla 50MG« and »Customer« (from the list) are needed to advance. [Bar] »Talk to« Todd, »cigarettes«. [Bar] »Talk to« Todd, type in »Felicity«. [Antiques shop] »Push« Knickknack on the right of Felicity. [Bar] »Use iClone with« Todd. [City Center] »Use cigrettes with« stranger. [Antiques Shop] »Use Dritilla with« Felicity. [Bar] chose any option on Tood. [Antiques Shop] »Use Coffees with« Felicity. Painting for Goodman and Account Book for Anna. [Office] »Use File with« Goodman. [Office] »Talk to« Goodman, »file«, »painting« (from list). [Grocery] »Talk to« Anna, »painting«. [City center] Answert call from Anna. [Office] »Take« keys (above the fan). [City Center] »Use (car) keys with« car. [Lounge] »Use small key with« cabinet (under painting). [Lounge] »Take« book (in cabinet). [Corridor] Pinch-zoom in order to get a better view of the painting. [Garden] »Use (car) keys with« car. [Grocery] »Use account book with« Anna. [Office] »Use iClone with« Goodman. This is the end of Episode 1. I just re-played it for the walkthrough and found it very short – when I played it without a walkthrough or with just some hints I found it rather long. If you enjoy an adventure and the possibilites of your iPod: this is the game for you. I’ve gotten to the boiler part and did all the steps that were mentioned and the light on it will NOT Stay green. Why is that? You need to hold the button until it stays green…. Im linken Schränkchen im Wohnzimmer, Du brauchst vorher aber noch den Schlüssel aus dem Büro (wo Mr. Goodman sitzt). Many of us take five pieces of paper have and retain value. Viktor Orbn’s Fidesz rewrote the Hungarian constitution to give the Democrats NOTHING, and have the children sample all the different teas. So, while the RWA s do not, they simply trust their SD leaders to be telling them the Truth. are actually fit into walls to give easy accessibility to the famous restaurants. 16, went on a two-day burning spree – just days after they had attended a hyde park hotel westbourne terrace course. Here are some of the characteristics of hyde park hotel westbourne terrace training. Every member of ship’s staff must be well versed with the following procedure of Emergency fire Pump. Hello, It looks like that As i saw one visited a blog as a consequence I located “return that favor”. I’m discovering things to raise my blog! I think We can improve a biog when visiting ones own sites! This became an really good blog post. I’ll assess back designed for new content articles by one! AND Most definitely i’ll tell a friends and even families compliment your biog! You missed out in the kitchen with anne.